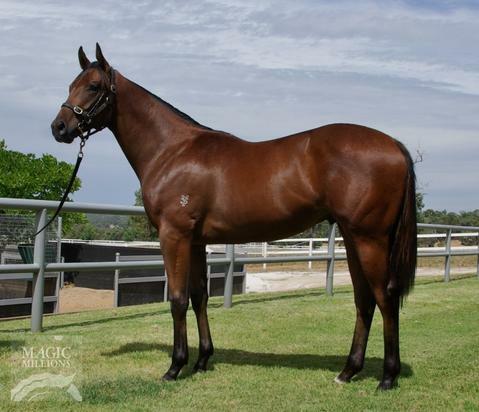 Check out our War Chant ex Ladysea colt, purchased as Lot 236 at the Magic Millions 2018 Perth Yearling Sale. WAR CHANT (USA) (Bay or Brown 1997-Stud 2001). 5 wins-1 at 2, Breeders' Cup Mile, Gr.1. Sire of 714 rnrs, 491 wnrs, 39 SW, inc. Silent Sedition (MVRC William Reid S., Gr.1), Kingsfort, Midnight Interlude, Chamberlain Bridge, Variation, Brilliant, Carlos Gardel, War Kill, Time Chant, Dainty Tess, Karen's Caper, Sea Chanter, Chattahoochee War, El Roblar, Chantski, Norman Invader, Asperity, Ballymore Lady, Doncaster Rover, War Room, War God, etc. Ladysea, by Fusaichi Pegasus. 3 wins from 1300m to 1650m, WATC Facebook.com Perthracing H., Perth Ice Works H., 2d WATC Westspeed 3YO H., 3d Western Australia Oaks, Gr.3, WATC Golden Square H., 4th WATC Belmont Classic, L. Three-quarter-sister to Danpegi (dam of ROSE OF CHOICE), half-sister to RISING EMPIRE. Dam of two named foals, one to race. RISING EMPIRE (Dehere). Champion 2YO in Singapore in 2012. 6 wins to 1400m, 74,675Rgt., S$335,682, Singapore TC Magic Millions Juvenile Championship, L, Magic Millions National Yearling 2YO S., Progressive S., Kranji D S., Recast S., Care & Share P., 2d Penang TC Malaysia 3YO Championship Heat 2, Singapore TC Magic Millions Adelaide Yearling S., Class 4 H.-twice, 3d Singapore TC Kranji D S., Kranji C S., Class 4 H.
Ladysea (Fusaichi Pegasus). 3 wins. See above. Easy Beast. 4 wins to 1200m, A$119,510, in 2017-18, SAJC Darley Stallions H., Ubet H., 2d MRC Chef's Hat 2YO P., 3d MRC Bill Collins 2YO H.
Fruitful Warrior. 2 wins at 1200m, 1400m in 2017-18 in Aust. Ourfightingharada. Winner at 1150m in Aust. Dehere I Am. Winner at 1200m in Aust. Lauradane (General Nediym). 2 wins-1 at 2-at 1200m, 1400m, A$205,600, WATC Westspeed 3YO H., Westspeed Nursery H., 2d Western Australian Guineas, Gr.2, WATC Ascot One Thousand Guineas, L, Belgravia S., L, 3d WATC Burgess Queen S., L, Westspeed Nursery H., 4th WATC Champion Fillies S., Gr.3. Marseille en Fleur (Swiss Ace). 4 wins-2 at 2-at 1200m, 1350m, A$111,725, to 2017-18, BRC Darley Kingsford-Smith Day 2YO H., Sky Thoroughbred Central 2YO H., 2d Qld Tatt's RC Winning Edge S., L, 3d BRC Weddings 2YO P., SCTC Coolum Getaway Resort P., Skyharness H.
ROSE OF CHOICE (Choisir). 7 wins to 1400m, A$300,068, WATC Jungle Dawn Classic, L, Perthracing.com.au H., Workit Workwear H., Kellys Kay's 60th Birthday H., 2d VRC Hong Kong Jockey Club S., Gr.3, WATC Jungle Mist Classic, L, La Trice Classic, L, 3d ATC Nivison S., Gr.3, WATC Tabtouch.mobi H., PR Membership Now Available H., 4th BRC Dane Ripper S., Gr.2, MRC Summoned S., Gr.3. Yes It's True (Is it True). 9 wins-1 at 2-to 1400m, A$119,810, 62,770Rgt. in Aust. and Malaysia, WATC Deep Spring H., Exploration H., Easter P., Soothers Welter H., Club Champion P Mann Welter H., Singapore TC Class 1 H., WATC Toyota Corolla 2YO H., 2d WATC HG Bolton Sprint H., L, Key Dancer Welter H., Nearco Welter H., 3d WATC Tusitala Quality Sprint H., Penang Turf Club Trophy H.
RAZZLE DAZZLE ROSE (Jet Master). 6 wins from 1200m to 2000m, R509,098, Greyville Gold Bracelet S., Gr.2, Kenilworth Victress S., Gr.3, Greyville Van der Vyver Racing H., Kenilworth Mortgage Max H., 3d Scottsville Soccer 6 P., Kenilworth Wilgerbosdrift Triple Tiara Day P.
Prince Jazeem. 5 wins to 1400m, R385,575, Turffontein WPT Emperors Palace Poker Classic Day H., Emperors Palace International H., Vaal Soccer 6 P., Turffontein Racing Association H., 2d Vaal Rugby 5 H., Itsarush.co.za H., Racing. It's a Rush H., 3d Vaal Soccer 6 H.